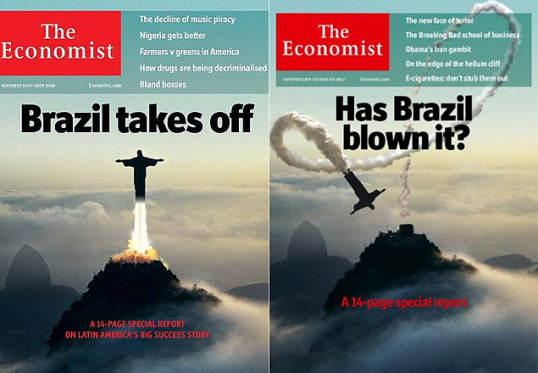 The Economist’s recent Brazil report started a huge debate that in Brazil at least centered on criticism of both the report’s style (the flashy cover) and its substance (impeccable reporting and reasoned analysis that dared to suggest Brazil is far from perfect). The magazine asked “Has Brazil Blown It?”and over 14 pages wrote about where Brazil is doing things right (agriculture, social policy) and where it is doing things wrong (education, infrastructure, politics). I’ve lived in Brazil for more than a decade, and written about it for dozens of magazines and newspapers and I long ago realized that if you write 10 nice things about Brazil and one not-so-nice thing Brazilians and Brazil-lovers will seize on the not-so-nice thing and presume you hate their country. It’s a sign of Brazil’s immaturity and lack of engagement with the wider world as well as an indication of how passionately people (including expat residents) feel about the place. For far too many Brazilians and Brazil-lovers, pointing out that there’s too much corruption, or red tape, or that the judicial system only works for the rich, or that the banks are nothing short of thieves means you hate Brazil. Because in Brazil, if you criticize something it means you’re against it. Who loves Brazil more? A corrupt Congressman who siphons off money that should be going to schools and hospitals? A young businessman whose drink driving kills an old age pensioner out walking her dog? A banker charging interest rates of 238% a year? Or the person who denounces the corrupt Congressman, the young businessman whose drink driving kills and the banking system that allows bankers to rob (and stunt growth and investment) with their criminal bank charges? To criticize doesn’t mean to hate. Sometimes it means exactly the opposite. A Brazilian Congressman was found guilty of embezzlement and organized crime earlier this year and sentenced to 13 years in jail, thus becoming the first parliamentarian in almost three decades to be imprisoned while holding elected office. Last night, his colleagues in the Chamber of Deputies voted that Natan Donadon should not lose his parliamentary perks. Brazil’s hated political class could not have sent a clearer message to their citizens. But if Brazilians really want change, then this is the time to act. It is at moments like this they must make their voices heard. They must tell their politicians that such decisions are unacceptable. Impunity is the grease that oils the wheels of corruption. It is time to take to the streets again and say, once again, Enough is Enough. Is This The Beginning? Or Is It The End? The protesters who took to the streets of Brazil’s biggest cities last night are to be congratulated on a significant victory. Few people imagined that after the violent police crackdown on Sao Paulo’s protesters last Thursday an even greater number would come out in sympathy just four days later. But they did just that and across Brazil hundreds of thousands of people, most of them peacefully, expressed their dissatisfaction with the status quo. Exactly how many people took part in the protests is impossible to know. But estimates suggest 65,000 people took to the streets of Sao Paulo, almost twice that in Rio and smaller, but still considerable, numbers made their presence felt in Belo Horizonte, Salvador, Porto Alegre and dozens of other towns and cities. The big question is what happens now. The protesters have the wind at their backs, so what will they do? They have called another march (in SP at least) for Tuesday night. Will they call more? Enter in to talks with authorities? As yet no one knows. A lot of that depends on exactly what they want. The unrest was originally sparked by a hike in bus fares and many of the protesters come from the Free Fare Movement, a group that wants free public transport for all. That’s an unreal demand. No serious country provides all its citizens with free public transport. But since then the demonstration has expanded to include broader issues. One major complaint is the cost of hosting the World Cup and the Confederations Cup, the second of which kicked off in six Brazilian cities on Saturday. The government is spending more than $3 billion on stadiums, some of them obvious white elephants but it hasn’t carried out many of the essential public transportation projects it promised. One of the challenges facing the movement’s leaders is articulating a message beyond that of, ‘We want better treatment and more rights.’ And until they do that it will struggle to achieve anything concrete. Brazil deserves great credit for lifting 40 million people out of poverty over the last decade. But ironically, that class of newly enfranchised people might be a cause of the unrest. 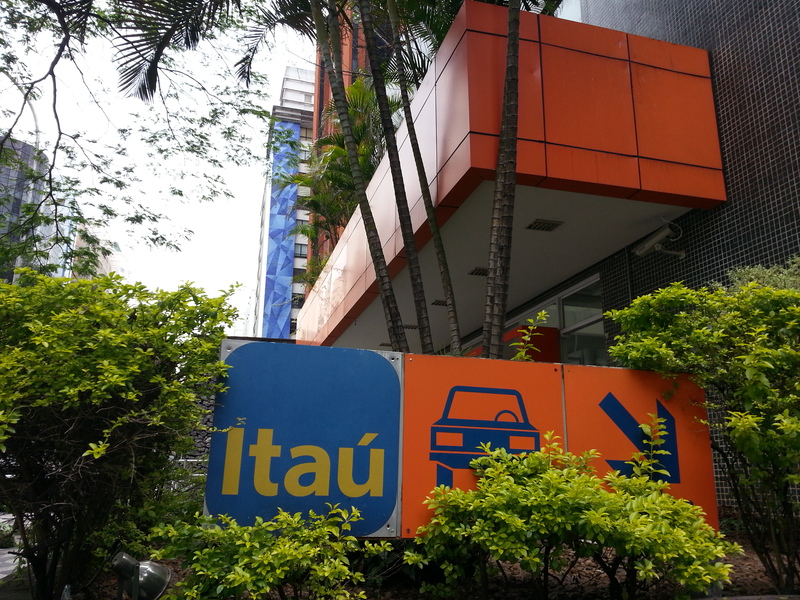 – More people can afford to buy cars and hundreds of new cars pour onto the streets of Sao Paulo each day. But the government hasn’t invested in infrastructure like roads or highways and public transport is underfunded and inefficient and an unappealing alternative. – More people can afford health insurance but the companies selling them not only provide a risible coverage, they fight tooth and nail to stop their clients from getting the treatment they are paying for, sometimes with tragic consequences. – More people have cable television but just try calling up and complaining about the service or trying to cancel it. The companies sadistically force their clients to jump through online hoops in order to hold them to costly contracts. – More people have cell phones and Brazilians pay some of the highest rates in the world. But calls frequently cut out, the signal is patchy, and after sales service is a joke. – More people have banks accounts but banks charge abusive interest rates – 237 % a year for credit cards – and they sneak additional charges onto bills, and treat customers more like waling wallets than valued customers. – Education is a joke. A tragic joke. 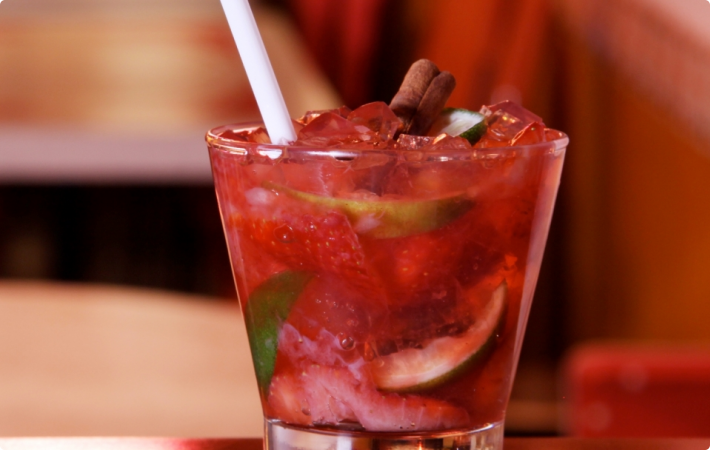 In short, there are lots of reasons why Brazilians should be angry. The other big question is how politicians will deal with the crisis. What possible answers can they provide? Not only are they discredited, they cannot hope to provide quick solutions to resolve long-standing infrastructure issues. They are in bed with the multinationals and conglomerates whose consistent mistreatment of and disdain for their customers is a complaint I hear every single day from Brazilians. It is hard to see how they can provide quick and satisfactory answers to the questions above. And last but not least, Are Brazilians going to see this through to the end? Brazil is not a politicised society nor one where memories are long or protests lasting. In neighbouring Argentina, hundreds of thousands of people take to the streets to protest graft and they do it again and again and again. Brazil’s media will play up the violence and they will play up the fear. If political parties try to hijack the movement it will lose its credibility. The middle class must get involved and stay involved. If Brazilians really want to see change they will need stamina and resolve. They may have to shout themselves hoarse over and over and over again. If this is really going to turn into something lasting then Monday night is not the end. It is only the beginning. Protest And Anger? Definitely. A Collective Revolt Against The State? Probably Not Yet. Brazil is not a country where people protest. It is not a country of revolutionaries. As Mauricio Savarese explains in this clear and didactive blog, Brazilians abhor violence and they avoid it all costs. If your cause embraces violence then you’ve lost. The only way to win in Brazil – and that means by getting the larger public behind you – is through peaceful protest and negotiation. That’s one of the reasons the reaction to last Thursday’s protest and police violence in Sao Paulo are so interesting. I’d love them to be right. Rubens Paiva’s definition of how the state treats its citizens is certainly spot on. Brazilians pay first world taxes and get third world services in return. Their politicians represent big interests and treat voters with little more than contempt. Corruption is ingrained, a part of the country’s culture and fabric. But there’s an awful lot of wishful thinking going on in some of the analysis. It is way too early to say last week’s protests mark a turning point. They could very easily peter out. If there is more violence then support will erode and the protesters will be marginalised. Is this the start of something? Are Brazilians waking up? Have they finally decided enough is enough? I certainly hope so and I do think it is inevitable, sooner or later. As incomes grow, people will start demanding better treatment. When enough Brazilians can make the trip to Miami and see they can buy a white tshirt in GAP for $8 dollars, rather than pay $30 for the same inferior quality garment in Sao Paulo and Rio they might be shaken into action. Last week’s protests might be the first sign of that. But I am not convinced that moment has arrived. A lot will depend on the character of the next week’s protests. If they are hijacked by the same extremists, who often glob onto anything anti- then they will fail. The middle class will take fright and abandon them. And without middle class lending their voice en masse they are doomed. If they can get lots of people out on the streets, from all sectors of society, and if they can demonstrate peacefully, even in the face of police provocation, then they might be on to something and the optimistic predictions of a paradigm shift might be realised. I don’t normally publish emails on my blog but this one is worth sharing, especially after the furor that erupted over this case involving the Atlantic. This is the sort of insulting thing that occasionally appears in my inbox, cheekily (to put it mildly) asking me to give away my work for free. William Barns-Graham, the Editor of New York Daily Sun and Content Editor at Allied Newspapers, should be ashamed. I don’t think he’d ask a plumber to fix his bathroom sink for free and neither would he have the guts to even suggest to a taxi driver that he drive him around gratis. Does he go to restaurants and ask chefs to whip him up a salad or pasta free of charge? Does he go to shoe shops and ask for free pairs of shoes? No. He wouldn’t have the balls. And yet he feels perfectly at ease asking journalists to give up their time to write ‘original content’ that will help him sell newspapers and online ads. And people wonder why journalism is in a state…. I’m writing to you from a global network of newspapers called Allied Newspapers – a network of newspapers including ‘New York Daily Sun’, ‘South American Herald’ and ‘Hong Kong Morning Star’. As a network we have already attracted 100,000 views this year despite our relative youth but we’re looking to expand this further. We are looking for freelance writers to help increase our network via interesting content and word of mouth exposure as well. In return your writing would gain greater exposure as part of our network – we have in the past had articles receive over 10,000 views individually and this is something that will increase as the network becomes bigger. Judging by your blog, you could be an ideal writer for one of our titles. We only accept original content and cannot at this stage pay for articles, but we can offer you exposure and a string to your writers bow in that you will be writing increasingly respectful titles. We are interesting in all sorts of articles ranging from world news to sport to academic expertise on specific areas and so on. We are libertarian so we are interested in being a platform for all political motivations and opinions but we do draw a line at anything that may be termed extremist or that may incite hatred of some sort. If you’re interested, please feel free to respond us at submissions@alliednewspapers.org and check out some of the titles posted in the postscript. I almost went to a balada this weekend but instead arrived home early having went through one of those small but telling experiences that reinforce my belief Brazil is still a long way from ever fulfilling its true potential. I arrived at the door to the Trackers club around 1 am with half a dozen friends, both foreign and Brazilian. Voodoo Hop, an otherwise admirable group that seeks to rejuvenate the city centre by running clubs and cultural events in abandoned buildings, were organising another of their successful club nights. After waiting half an hour to edge up the queue and get in the door, we discovered that there was another queue inside the building to get into the actual club. My friends – most of whom were a good deal younger than me – took it in their stride. I was outraged. After another 10 minutes waiting in the second queue that snaked up two flights of stairs, I left. Brazil has problems with lots of things that won’t change overnight. Corruption, antiquated infrastructure, a putrid political system, and the obscene amount of power leveraged by multinationals and construction companies are all ingrained in the culture and will only improve with government intervention or massive pressure from society, neither of which looks like happening any time soon. But the stupid invention of bureaucracy for simple tasks like getting in a night club is easy to resolve. One queue, fine. Two queues, pointless and self-defeating. The big worry I have here – and this is the part that reinforce my belief Brazil is still a long way from fulfilling its potential – is that I was the only one who saw anything wrong with this. What was worse was that the young kids waiting in line accepted it as normal. There was no outrage at being made to stand passively in two different queues, much less being made to stand passively in two different queues for the right to hand over a 30 real entry fee. I voted with my feet. Unless more people do the same, the bureaucracy and BS is never going away. The Brazilian Senate just elected Renan Calheiros as its president, thus making him the third highest ranking politician in the country after the president and vice president. Calheiros resigned this post in 2007 in order to avoid impeachment after he was accused of using money from a lobby group to pay alimony to a former girlfriend and of using false documents while lying about the scandal. He currently faces fresh charges, with the country’s top prosecutor accusing him of bribery and using false documents to justify illegal payments he was receiving. The Senate chose to ignore those accusations – and his dubious past – and this afternoon elected him by a margin of 56 votes to 18. Innocent until proven guilty is a fundamental principle of democratic societies and Calheiros has the right to defend himself and to run for office. But if they had rejected his bid for the presidency, Senators would have sent out a positive sign that ethics and morals are important factors when choosing those who will lead the nation. Instead, they gave Brazilians one more reason to loathe their politicians. The election of Calheiros is a perfect example of why.